All vitrified clay pipes are manufactured in standard lengths. There are times when site conditions may require lengths which are deviating from these standard lengths. To adjust pipe lengths to the requirements on the site, pipes can be cut using cutting chains or cutting machines. In this scenario, the standard flexible joints come into play & can be substituted by mobile flexible joints, such as “P-Ring” and “M-Seal”, which provide fast and equally reliable joint connection as the standard joints. P-Rings are used as sealing elements for joint K in connection system C, for the spigot of the shortened pipes and fittings. Furthermore, they are also used as sealing rings for the transition from spigot of connection system F to joint K of connection system C. They are available in sizes DN 200 mm to 600 mm for the pipes of standard & extra strength. The collar seal is used to connect two spigot ends when replacing a pipe with junctions or when replacing pipes. 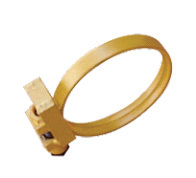 The collar seal is available in nominal sizes DN 100 mm to 1200 mm for pipes of ‘SS’ & ‘ES’. The collar seal can be used with all pipes whose external diameters fall within the tolerance range. At times, due to the site requirements, a connection between clay pipes and other materials such as PVC or cast iron can be needed. 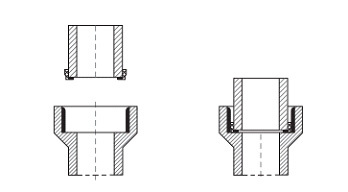 Due to the differences in dimensions such as wall thickness and tolerances, a direct connection will not be possible. In this case, the use of adapter pieces such as the U-Ring or A-Ring is advised. The U-Ring is used to connect clay pipes sockets to the spigot end of PVC or cast-iron pipes. Available in nominal sizes DN 100 mm to 200 mm. 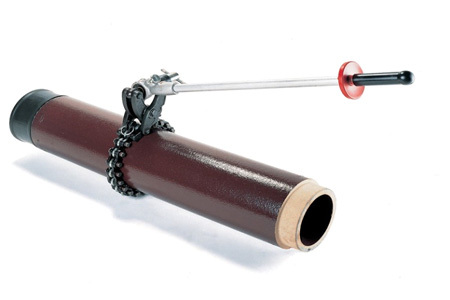 The A-Ring is used to connect clay pipes spigot ends to PVC or cast-iron sockets. Available in nominal sizes DN 100 mm to 200 mm. 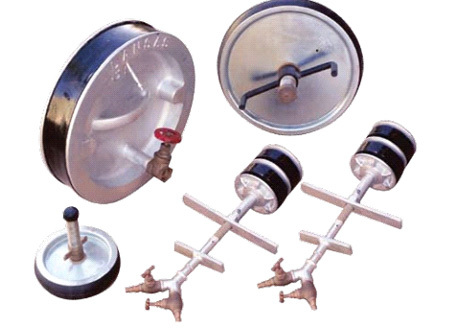 For connection of clay pipe with PVC pipe, spigot–spigot with different outside diameters. Sizes available: DN 100 mm to 300 mm. Used as sealing ring when the existing main pipe is drilled with hole to provide for a branch or housing connection. Sizes available: DN 150 mm & 200 mm. The quickest and simplest way to cut a clay pipes is by using a cutting ring for sizes DN 100 mm & 150 mm. For nominal sizes to DN 400 mm the cutting chain is employed to cut the pipes. For cutting larger nominal diameters, cutting disks are used. 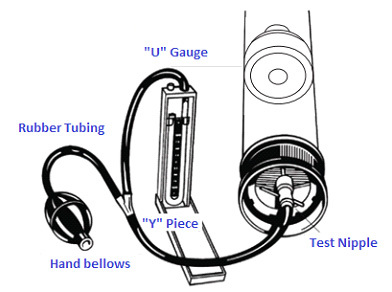 “U” Gauge is used for air pressure tests for clay pipes. Available in sizes from 4″ (100 mm) to 48″ (1200 mm). Available in sizes from 150 mm to 1500 mm.